Community Development Cell (CDC) of Career Point University has been established in collaboration with Dr. Kaushal Kumar, Professor Jawaharlal Nehru University, New Delhi. 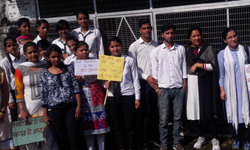 Community Development Cell, Career Point University, Hamirpur (HP) established in 2016 is engaged in changing the face of rural Backward Panchyat Mehal of Himachal Pradesh through its many fold development schemes, the cell is working in a participatory manner with the rural folks and engaged in the implementation of different rural development and the agencies poverty alleviation. Change in outlook of the inhabitants. Provide minimum essential health services and improving existing health practices. Provide required skill to the d children and adults as well as recreational facilities. Improve housing and family living conditions of villagers. Develop a responsive village leadership, village organization and institutions. Help people that they can increase their income and quality of life. To contribute towards empowerment of the women youth and local people( villagers) through agencies of different CDPs. To capacities the villages for below, healthy safe and holesting development. University has adopted Gram Panchyat Mehal for the benefit of local people for holistic development of the panchyat. In a Mehal Panchyat, a socio-economic survey has been made by the volunteers of National service Scheme and Community Development Cell. This survey has presented the ground reality of status of education, creativity, awareness towards Governmental policies and health & sanitation of villagers in Mehal Panchyat. 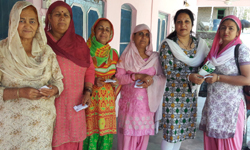 Signature Campaign on "Beti Padhao Beti Bachao" by CDC, an outreach programme, visited the villages. 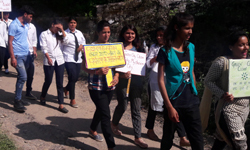 Door to door awareness created Against Pollution, in the village Mehal by students of CDC. Incubation and Entrepreneurship Cell, CPUH hosted a Seminar on "Why and How to be an Entrepreneur?" Training on "Pine Needle Charcoal Briquettes - Briquettes design analysis and mould fabrication, briquette making, stove design and fabrication".